May 10, 2017 By Roddy Russell Jr. I will admit…I wasn’t just not confident, I wasn’t just worried, I was scared. I was frightened. Atlanta United has been one of this season’s scariest clubs to go up against. But! I’m not scared anymore! We got one win against them, so no need to be! Let’s talk about that win at Yankee Stadium, shall we? 1. This was the first time New York City FC has played a younger team (2 seasons younger). But this doesn’t really matter much, since Atlanta United FC has been playing like they’ve been an MLS club for years. 2. We made it to 30 wins in club history! 20 of these wins have been under Patrick Vieira. 3. (Had to do some math on this one, but I tutor math, so no problem.) NYCFC’s second and third goals, respectively scored by Rodney Wallace and Maxi Moralez, were the second fastest back to back goals in club history at one minute and 50 seconds (59:10 and 61:00). This time beat the one minute and 55 seconds set during the match against San Jose Earthquakes in 2015 (62:24 and 64:19), but the one minute one-two in the 4-1 home win over Chicago Fire in 2016 (7:36 and 8:36) still stands as the club record. And yes, me being a math head, you can definitely bet on me keeping track of this. 5. City has another streak going on. Along with the two straight away wins, NYC has strung together back-to-back wins for the first time this season. Before this game, City won every other game. 6. My friends (who I never met) at WhoScored.com gave Wallace a 9.5 rating and man of the match honors for scoring a goal and assisting the other two. David Villa is second at 8.2, and Moralez is third at 8.0, each with a goal. Honorable mentions to Ethan White (7.1) with the assist on Wallace goal, and to Alex Ring (7.0) for joining Wallace on MLS Team of the Week with Villa on the bench. 7. Atlanta United has scored first in all of their matches this season…except this one. 9. 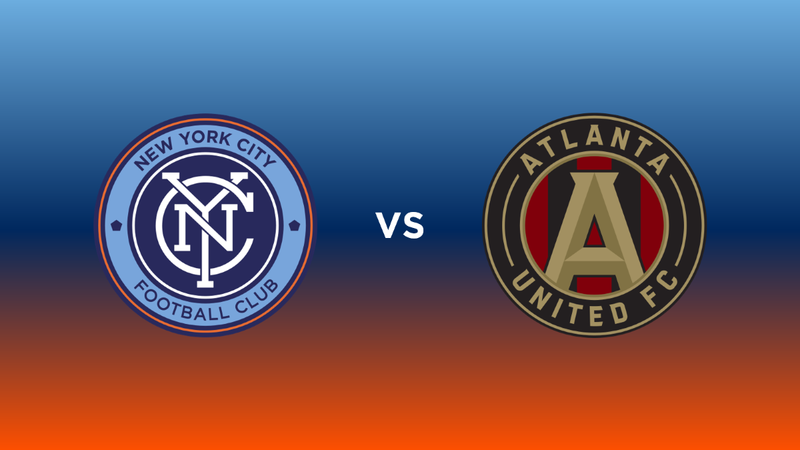 Fact from Andres Soto: “Villa’s first goal for NYCFC against New England Revolution looks similar to his goal against Atlanta. And I’m pretty sure it was scored on the same side of the pitch.” Andres, you, my friend, are spot on. Same side, same foot, same technique. Only clear differences are: this goal against Atlanta United was scored exactly two minutes earlier (16:51 versus Atlanta and 18:51 versus New England), his shot hit the post then went in for this match, and Villa ran off the other way in celebration. Also, it looks like he may have been a bit further out from goal in this match, about a yard and a half. So, yes. I am not scared anymore of Atlanta. Wait…what would happen when Yamil Asad and Josef Martinez come back for them? Uh-oh…no, no, no. We’ll cross that bridge when we get to it. Let’s focus now on FC Dallas—oh, Dallas is…no! Confidence!